One of the most challenging and rewarding projects we take on each year is the production of the official Waste Management Phoenix Open souvenir program. It’s a 2oo-page book that’s loaded with editorial articles covering the history of the event, TPC Scottsdale, The Thunderbirds, the players, Birds Nest, among other things. 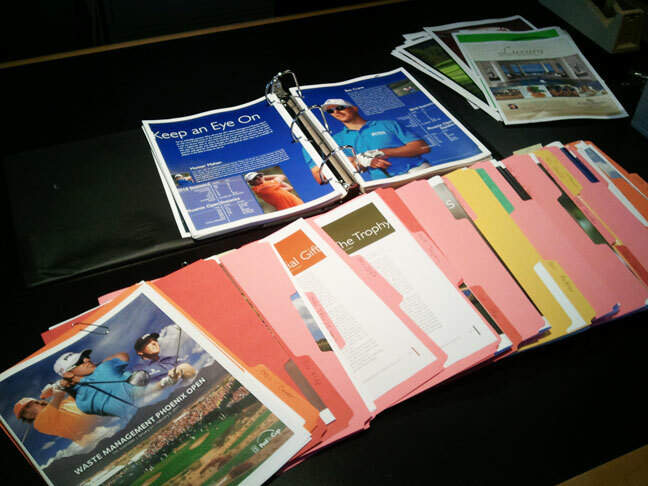 We employ the help of local golf writers as well as pen a few of the stories ourselves. Title sponsor, Waste Management, fills a few pages with their latest corporate news, including their many green initiatives. We set aside a few pages to feature the many heart-warming charitable endeavors spearheaded by The Thunderbirds. The Mayors of Scottsdale and Phoenix as well as the Governor take a page to say hi. In addition to editorial content, dozens of advertisers insert ads into the program. And our art director wrestles all these moving parts together and makes sure the final product looks good. As I mentioned, it’s quite the production. Gives us an appreciation for publishing companies that do this sort of thing every month, yikes! Next time you’re out there, pick one up!